Hello, commanders back again with a brand new update regarding what you can expect this month in the Alpha Program. March will see lots of activity involving Battle for Sularia and the Alpha Program and we can't wait to show you this month's cards and brand new promo cards! The Alpha Program is now in high gear as over 50 of you have downloaded the program since it's inception! We are so very pleased with the amount of participation and feedback we are getting. The Protoans are coming to Kickstarter on March 20th of this month and here is what you can expect from the campaign. We had discussed in the Future of Sularia update that we would be running the campaign with only trying to fund the remaining art needed for this faction. When we started doing the math on this we realized we should probably just simplify things and offer a single pledge that would get you Faction Pack: Protoan. Existing Battle for Sularia customers will pledge for the Protoan and they will be delivered later this year. No need to hold onto your coupon code and order them from us at a later time. Additionally, if you are a new Battle for Sularia customer you will find an additional pledge amount that will get you all of the content up to and including the Protoan. This will bring you up to speed with anyone else that is already into the game. You will find in this campaign a few things of interest. Stretch Goals to make Reign of Terror—Part 1 a retail pack versus a print-on-demand project. We will be announcing more about this soon, but be sure to mark your calendars as we will go live at 10:00 am CDT on March 20th. Over the coming weeks, we will create an event in our Battle for Sularia Facebook community that you can join and we might even be doing a few fun things there during the campaign that you won't want to miss! March signifies the newest command pack to be released into the Alpha Program and much like February's release, there are some cards here your collection simply cannot be without. We have decided internally that we will not be issuing errata's to alpha cards as we get feedback. Instead, your feedback will be directly applied to the final Omega Program releases based on everything we've collected from you as well as from our internal testing. So please rest assured that we've heard you and we are going to make changes, we just are not going to deploy those into the Alpha Program. So without further ado, we should dive right into this month's promo cards. This month's Jotune card is a doozy. A brand new Jotune Type 1 combatant for 3 sularium and only 1 construction cost! Jotune deck builders can now rejoice as they incorporate strong combatants that cost points without needing an expensive type 1 to enable the Art of War. 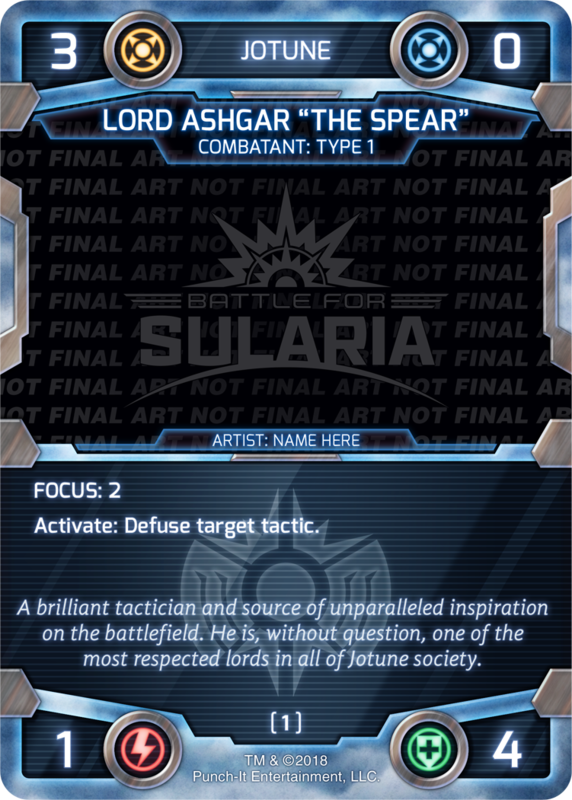 To further push the Jotune strategies, Lord Ashgar poses a powerful ability that lets him defuse tactic cards! This is just the first of many cards that will start to see a major uptick in counter play existing in the metagame. Not only for the Jotune but for the other factions as well. The Synthien have always had big powerful mechanized robots like the Hydra Reaver, Assault Synthoid, and everyone's favorite Hekaton Warhulk. For those of you that prefer to play Synthien for their combatants then this month's combatant is perfect for your arsenal. The Warp Stalker is a powerful 2 sularium combatant for play. At 5 attack and 1 defense, the stalker is vulnerable to direct damage counter play from the likes of Booby Trap, Vassad Saboteur, and Solomon. But the ability and Hidden more than compensate for this weakness. At 3 construction cost, the Warp Stalker is expensive in the deck, but this decision was based on the idea of preventing huge burn tactics like Feedback, Sularium Tactical Assault Beam, and the early game aggro threat from taking over the meta. We do look forward to hearing your thoughts on this card because it has the unique ability of really pushing through early sights, and a single Animus turns it into a 7/1 Alpha Strike! Last month the Protoan got a type 1 combatant that showed how each card in their deck will have significant value. This month the Protoan are getting a card that prevents getting hard locked in one of their most challenging matchups. Protoan players will begin to fear the Synthien as cards like Sularium Storm, Centropolis, and Satellite Network Facility are very good against them. Infestation presents for the first time ever a card that defuses a site and its abilities. Much like how Interference or Disruption can hit conditions, Infestation is providing the same ability targeted directly at our opponent's sites. As a reminder, this defuse ability will not only remove the card text from the text area, it also can turn off the built-in sularium production of that site. This is a powerful tactic for the Protoan to use to help keep and maintain their tempo after board wipes and other major controlling efforts. Please remember with this card that it cannot target a site that is resolving off of the command chain, that site must resolve to play before it can become a legal target for infestation. Power Broker represents exactly what the Exsularian want more than anything, influence, on the world of Sularia. With each Power Broker in play, Exsularian players can push up their influence level significantly, allowing themselves to potentially skip the middle of the site curve and go on to much larger influence costing sites. Additionally, Power Broker helps synergize and push up one of their most effective 1 construction cost combatants—the Tackey. Exsularian combatant strategies should have some number of Tackey cards in their deck, and Power Broker at this stage is pushing players deeper into Tackey as a staple. Additionally, Power Broker used during the Influence phase also increases your Influence generation, enabling some of those higher cost tactic and condition cards to come online earlier in the game than they can without Power Broker. We have on our site at the time of this blog update the signup for the March Tabletop Simulator Tournament. 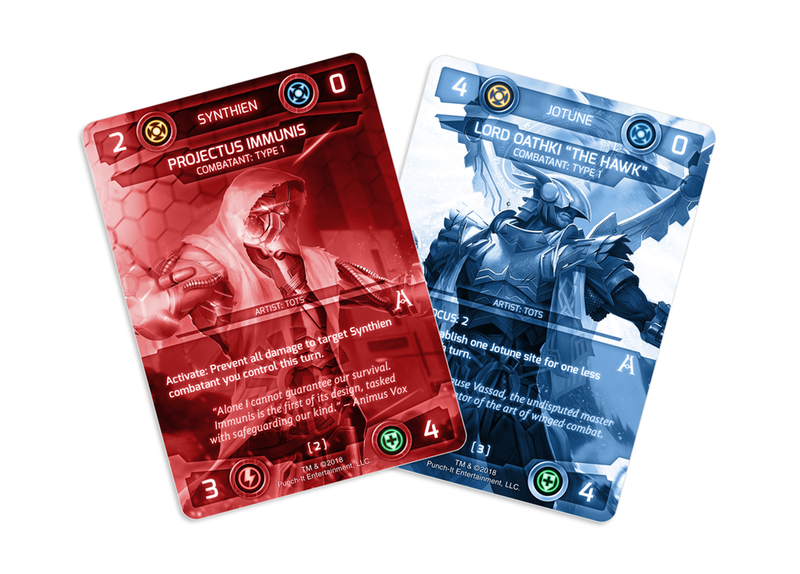 The winner of this tournament will get a set of either Projectus Immunis or Lord Oathki "The Hawk" Alpha Program cards for free! The tournament will be held on Saturday, March 24th, starting at 12:00CDT and should hopefully be concluded by no later than 6:00 pm that day. However, that is subject to change based on participation. If we have less than 8 players we will play a round-robin format, and over 8 players we will switch to a Swiss format. At 16 players we will cut after 4 rounds to the top 4 and play a semi-final and final match. Sign up for free on our Alpha Page. Please remember that CPS1P2 is legal in this tournament. The Alpha Program march promo cards will be released today for you to begin pre-ordering. You can expect an email with the codes for these cards today, and if you are already signed up for the Alpha Program you are good to go to purchase them. If you are not signed up, be sure to use the signup form on the page and we will email you the promo codes within 48 hours of your signup. If you do not get the email, be sure to check your spam folder, then please email us at webmaster@punchitent.com and we will provide you with the codes directly. Let's officially welcome Projectus Immunis and Lord Oathki "The Hawk" to the Alpha Program! We think they look pretty awesome and hope you do too! Phew, March is a busy month, but we are super excited at the possibilities and cannot wait to add even more to the list as we go. As always stay in touch with us by signing up for our newsletter or following us on your preferred social media platform and we will be back soon with even more exciting stuff to talk about.